Videos of what's happening on ground serve as"cyber-space echo-chamber"
WASHINGTON (CNN) -- The Iranian-American community is half a world away from the turmoil in Iran, but they are tuning in, logging on and even stepping out in demonstrations to show solidarity with relatives and friends. 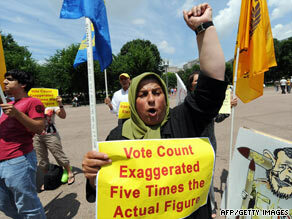 Iranian-Americans protest Iran's election results in front of the White House in Washington last week. Americans with Iranian roots showed their interest in the election Friday by voting at more than three dozen polling places from Washington to Los Angeles. And now the post-election turmoil has ratcheted up that interest higher than ever. "The Iranian-American community is hungry for all news and information coming out of Iran," Afshin Molavi told CNN on Tuesday in a telephone interview. Molavi was born in Iran but grew up in the West. He is affiliated with the New America Foundation, a Washington think tank, and has been a frequent commentator on events in Iran. "We are seeing real excitement," Molavi said in a telephone interview. "Not since 1997 have we seen this." That was when reformer Mohammad Khatami was elected president. Iranian-Americans check newspapers and cable news outlets but are also turning to YouTube and social networking sites such as Facebook. "They will tune in CNN first. But they will spend hours in front of a computer searching YouTube, Twitter and Facebook," Molavi said. "YouTube is easier to process. It is just raw video of what is on the streets of Iran." He said Iranian-Americans are carefully following how protests are going not just in Tehran but also in other Iranian cities. The videos become what Molavi calls a "cyber-space echo-chamber" with people sending and forwarding other favorite snippets of video. One video making the rounds -- http://www.youtube.com/watch?v=dSECAvBTanQ -- appears to show a large crowd of opposition candidate Mir Hossein Moussavi's supporters on the march. Then it cuts to a police motorcycle burning in a street and shows the crowd protecting the fallen police officer, offering him water. Molavi says it's popular both because it is a dramatic slice of life and because it shows Iranians feel a kinship even to those trying to stop the demonstrations. Individual Americans have been trying to maximize communications with Iran, even before the election. MetroStar Systems, a New Jersey company, recently launched its own Facebook application, called Iran Voices, to speed up the flow of information and political debate. The company had done work in the past for the State Department and developed a cell phone game called X-life. But MetroStar says Iran Voices was done completely independent of the U.S. government. MetroStar's CEO is Ali Reza Manouchehri, an Iranian-American who went to high school in Iran. "My identity is Iranian-American, and my passion is cyberspace and democracy," Manouchehri said in an e-mail message to CNN. "Utilizing tools such as Twitter, Facebook and other social media applications provides an unrivaled forum to keep myself and other Iranian-Americans directly involved in real-time while these unprecedented events are unfolding on the ground." The site -- at apps.facebook.com/iranvoices/main -- has communications from people in Iran and the United States, via Twitter and other sources. And sites such as Iran Voices have become even more important as the Iranian government has tried to stifle communications between Iran and the outside world. The U.S. government is carefully sticking to the sidelines in the uproar over the Iranian elections. But one outpost of Iranian-Americans, the U.S. taxpayer-funded Voice of America, has been beefing up its operations and increasing its television broadcasts to Iran. VOA's Persian News Service -- online at http://www.voanews.com/Persian/ -- has expanded its daily broadcasts in Farsi, and just introduced a new morning program. It says it has been "flooded" by thousands of videos, pictures, e-mails and calls from inside Iran that it passes along to its audience. VOA had established additional satellite paths before the election to limit government jamming, according to one VOA executive. All About Facebook Inc. • Tehran • U.S. Department of State • YouTube Inc. • Iranian Politics • Twitter Inc.